This will be the last nail post for awhile... where my nails are longer. I had another low break on my left thumb nail, and was like 'eff this, you're all going!' and just clipped them all down. Which some would think is really upsetting, but I quite like having shorter nails. Small bonus for moi! I was at London Drugs the one evening, perusing their nail polish, and they had a wealth of OPI polish marked down.. and one in particular caught my one - it was one in the Coca Cola collection that I had wanted, I just never got my mitts on it. That night, I did. And then this mani happened. 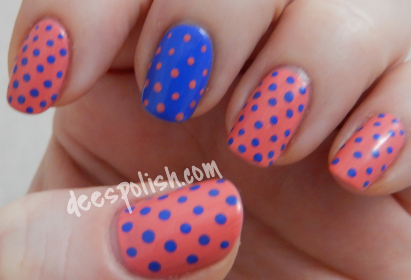 I love this peachy-pink and blue combo! With a smattering of dots? Perfecto! See you all again soon with another post! Dim the Lights.. It's Floral Time! You Are Outta Lime! + Where's My Blanket?? ?